Day Seven - the last day! I've used on today's project! I love the way this card turned out. It's so pretty, and could so easily be mass produced! the stamps that are used in that day's post! with our challenge winners in the December Challenge post!!! Labels: D512 Joy , H277 Snowflake Dove , Patti J. Beautiful card! That blue is gorgeous, and I love how you split the card front and used gems in the space between your two main panels! I'm thinking maybe your inspiration was "Joy to the World"? 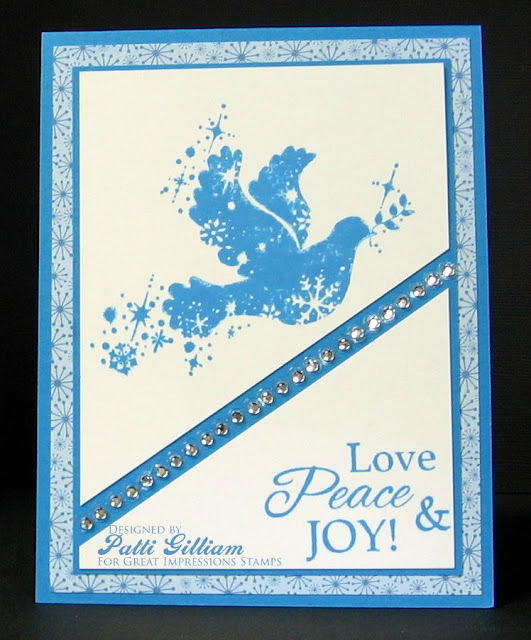 Beautiful Christmas card, love the dove with the snowflakes! Either Elvis's Blue Christmas or Hark the Herald Angels Sing. This is a gorgeous card! I like the monochrome blues! I think it's "Joy to the World." or 'Joy to the World'. Lovely monochromatic card, Patti. My guess is "Joy to the World". I love this all in blue and also the split panel. Adding the line of gems really is gorgeous. I think the carol is Joy To the World. So pretty and look at all that BLING!!! Really beautiful card in the soft blue and white with that dazzling image. Just like Carla, I keep thinking "love and joy come to you" from Here We Come a Wassailing, also, but it is probably Joy to the World. I'm stumped, so I'm going out on a limb - how about Elvis' Blue Christmas. Such a gorgeous card, Patti! Your rhinestones really add some holiday sparkle. I think the song must be "Blue Christmas."